Victoria Pozo Bernal interviewed flower workers in Bogota, Colombia. 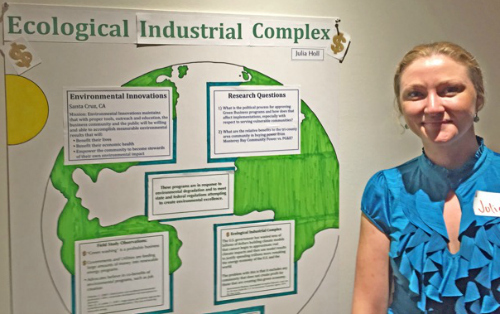 Julia Holl worked on community-owned power options in the Monterey Bay area. Crystal Centeno and Augusta Alexander, in field studies in Los Angeles and Oakland, found themselves on a conference call discussing common issues. 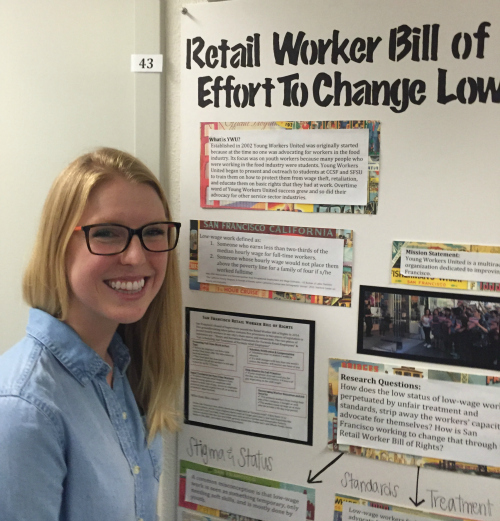 Tessa McWalters helped organize a retail workers bill of rights in San Francisco. The six-month full-time field study has been the heart of the community studies major at UC Santa Cruz since the program began in 1969. 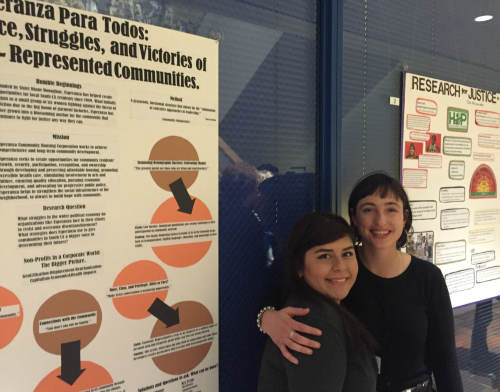 After students return, they present their findings and experiences with a poster that describes the synthesis of field study and classroom-based learning. Last week, 44 students and their posters lined the narrow hallways of the Oakes College Academic Building in the second annual poster session since the major was reinstated nearly three years ago as a program at Oakes. Students complete the field study during the summer after junior year and the fall quarter of the senior year. Field placements this second year were primarily in the San Francisco Bay Area but were also located in other parts of the nation, with international placements in Guanajuato, Mexico, and Bogota, Colombia. As the longest running interdisciplinary program at UC Santa Cruz, community studies has been a pioneer in experiential education with a focus on social justice. Students were enthusiastic as they described for classmates, friends, faculty, and other visitors what they saw, accomplished, and learned. Community studies alumni also returned to campus to experience “Community Studies 2.0,” as program director associate professor Mary Beth Pudup likes to call the revived program. Julia Holl said she enrolled at UC Santa Cruz as a re-entry student before the community studies major was reinstated and eagerly declared the major once it returned. She had previously worked for seven years at the front desk for Ecology Action in Santa Cruz and wanted to return to college to improve job prospects. For her field study, she worked with Environmental Innovations in Scotts Valley on a Monterey Bay community power project. She’s already started working as an aide to Assembly member Mark Stone and will go full time when she graduates in five weeks. Victoria Pozos Bernal interviewed 350 flower workers in Bogota, Colombia for her research report on the flower industry. The daughter of farm workers from Watsonville worked with Pasos Internacional, the Project for International Accompaniment and Solidarity in Colombia. At first it was difficult to get the workers to open up about working conditions, she said. Among other things, workers told her they are informed a week before inspections from fair trade groups and have a chance to clean up and prepare. She also investigated two workers unions and their different strategies for worker protection. Pozos Bernal was one of two students at the poster session whose field study organization had been founded by an alumnus of the community studies program: Pasos Internacional was started by Nate Miller (class of 2011). Antonella de la Tore worked at Pie Ranch, a food justice organization and working organic farm in San Mateo county founded by Jared Lawson (class of 1992). Two other students were surprised when their respective field studies – one in Los Angeles the other in Oakland – landed them on a conference call to work on common issues. 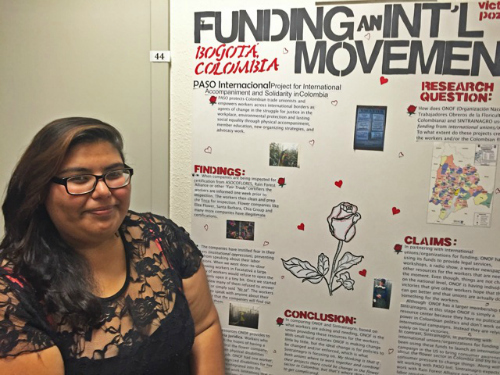 Crystal Centeno, a double major in community studies and politics, was working on economics of community development in the Figueroa corridor in L.A. with Esperanza Community Housing. Augusta Alexander was in Oakland with Human Impact Partners, focusing on community health issues. Centeno said oil wells in the south L.A. area are affecting the environment in neighborhoods where she worked, and also where she grew up in Pico Rivera about 15 miles to the east. She and Alexander ended up collaborating on strategies to improve the health of residents through community organizing and a “people not wells” campaign. In San Francisco’s Tenderloin district Tessa McWalters, a transfer student from Sacramento, helped organize a retail workers bill of rights with a group called Young Workers United. The campaign is focused on young workers, particularly in the food and service sectors, who typically receive low wages and little job security.